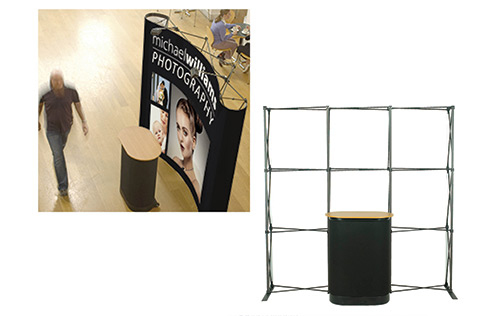 We offer three pop-up systems - Element is a basic bundle including the frame and wheeled case, Advantage (curved) and Advantage (straight) bundles includes the frame and wheeled case as well as flood lights, beech top and fabric wrap (used to dress the case). Please phone 0800 999 KWIK and ask for further details to be emailed to you. FAST – We can design and supply in 2-3 days.